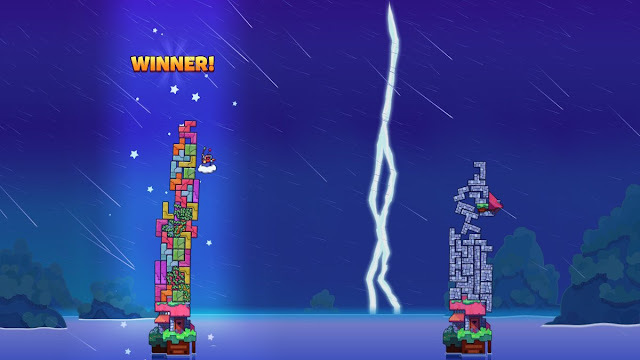 If you were to take the ingenuity of Tetris and merge it with the nail-biting physics of Jenga, you’d get Tricky Towers. Using tower building mechanics and realistic block physics, players must build structures in a variety of game modes. With a format very similar to the aforementioned Tetris, blocks fall from the sky and must be fitted together, however the objective is different as it has players building structures rather than clearing rows. There are three modes in Tricky Towers: Race, Puzzle and Survival. In Race, you must build high enough to hit a goal. In Puzzle, you will have to do the opposite. You will lose if any blocks hit a certain line, creating really unique situations as it becomes less about how well you can stack blocks and more about how creatively you can fit them. Survival is the final mode and a blend of the previous two as you must place as many blocks as possible without them toppling off the side. If that happens three times, it’s game over. I don't know how I'd rank any game mode above the other - as each one has its own merits - although I did find it a little disappointing how some versions are restricted to either solo or multiplayer sessions. For example, you can’t play endless with your friends nor can you challenge them to take on the trials with you. 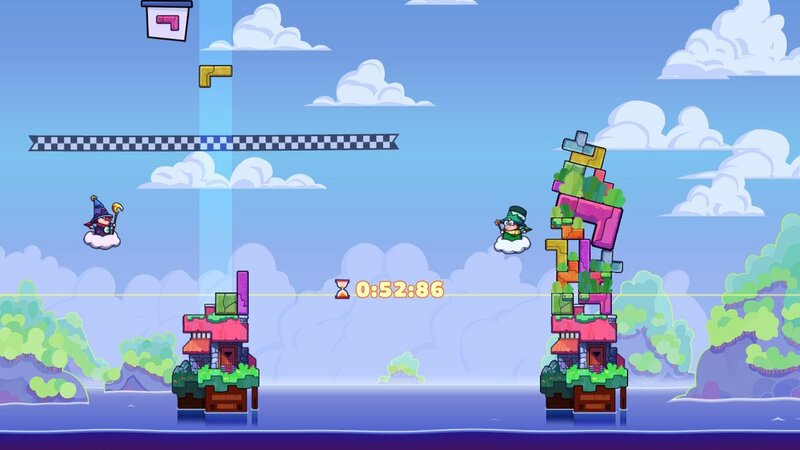 Physics is an important aspect of the game, as was demonstrated when playing a race against an opponent. I had nearly built a tower to completion – merely centimetres away from victory – when a violent wind came and toppled the tower over completely, forcing me to start anew. On higher difficulties, factors such as wind and rain will also affect how the blocks behave after they've been placed. This feature is certainly punishing when it affects you, but it’s also what makes the game so frustratingly addictive. Rushing yourself can often be your downfall, whereas it pays off to keep at a steady and careful pace. Another unique twist comes in the form of light and dark magical spells used to either help yourself or hurt other players. For example, there’s a power that will grow vines on the next block you place, which can then spread to adjacent blocks to create a stronger tower. If you’re feeling particularly evil, there’s a dark magic spell that causes opponents’ blocks to be three times larger and heavier, causing a massive disruption in their flow. It feels like there are about a dozen of these abilities overall, creating additional chaos within the tightly packed matches, while also widening the degree of interaction between players to enhance the competition. It is important to note that Tricky Towers is primarily intended as a multiplayer experience. For the amount of content it offers, the game is ideal for parties. Playing against three or four opponents amounts to countless hours of fun and the quick nature of each match allows endless opportunities. That makes it a perfect port for the Switch, a console suited for both short and long group sessions. As a solo experience, the content can dry up a lot quicker. There’s a challenge mode where you’ll play through modified stages that get progressively harder. Completing these levels earns stars with which you can unlock harder stages. Alongside that there’s also an endless mode where you can see how long you can go on for in each of the three stages. The singleplayer content can be charming for a short time, but I don't think it's anywhere near as interesting as what the multiplayer provides. I also think there came a missed opportunity with what modifications you can change in each match. As it stands, you can currently only choose what game mode and difficulty level you want, but it would have also been really interesting if we could alter certain variables such as wind strength, block speed and size of the map. If you’re after a game to play with a few mates, Tricky Towers is more than worth the price of admission. The way the blocks interact with each other as well as how other factors affect the physics of the tower-building system works perfectly and becomes equally charming as it does frustrating. 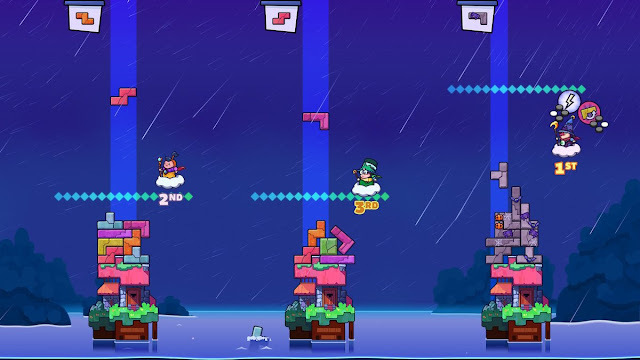 WeirdBeard built a large foundation for the game to grow, with the potential for further game modes and mechanics to be added later down the line. And most importantly, the fast-paced nature of each game makes it a must-have for parties, and is even ideal for people who don’t play videogames. Disclosure: Tricky Towers was supplied by Game Drive NL.